The Idea: Make car rear-view mirrors, exterior and possibly interior, out of a more flexible material, thus allowing the driver to mechanically adjust the shape of the mirror to be more concave (zoom in but narrow focus) or convex (wider field of view) while driving. The primary benefit would be a quick spot check of blind spots without having to do a full over-the-shoulder check. The secondary benefit would be enhanced visual acuity when backing up. The system would seem to have a few key parts: the flexible mirror, the actuator to warp the mirror, and the driver interface. Hopefully a good materials engineer could come up with a shiny surface that is weather and impact resistant for the mirror? The actuator would likely be a small motor with an arm attaching it to the mirror at specific points to bend the mirror as desired. The interface would likely be the hard part, in my layperson’s opinion. The trick will be giving the driver something simple and intuitive that does not require a more distracting body action than a shoulder check. My best idea was a thumb button at the two o’clock position on the steering wheel which, while depressed, the mirror becomes convex, release it and it returns to normal. However, this does not elegantly help with the backup feature, or the concave option. Hopefully a good human-factors engineer will have better ideas?! The background: This idea came to me several years ago when I hurt my right shoulder and neck and it was very uncomfortable to do shoulder checks while driving. While my rear view mirrors are pretty well adjusted to reduce blind spots, I still shoulder check out of habit. The hope is this would be an optional safety enhancement that finds its way in to wide adoption. This one comes to us from our friend Andy and is a simple elegant solution to a problem we all have from time to time. Visual and/or tactile indicator of the unspool direction of the toilet paper roll. The Idea: Directional indicators throughout the toilet paper roll to indicate the unspool direction. There are lots of different ways to approach this, but a simple colored arrow strip on one side of the roll would probably work well. 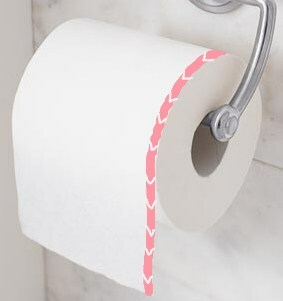 When replacing the roll, knowing that the colored strip goes on the left (or right if that’s how your family rolls) will avoid that annoying spin-and-seek for the starting sheet, and the more annoying keep spinning until it unwinds to the floor dilemma. Arrows in the strip will give a strong visual clue to the seated user of proper unroll direction. Tying into other ideas posted, you could also put the remaining sheet count every 50 or so sheets in the strip (see End of the Toilet Roll Reminder).